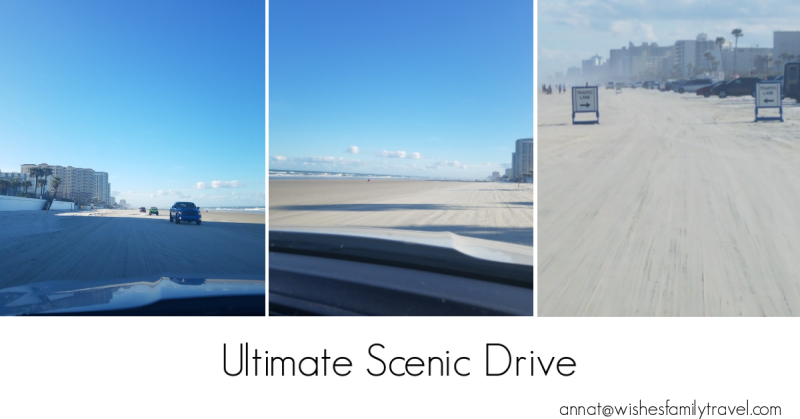 The Ultimate Scenic Drive: Driving on Daytona Beach! 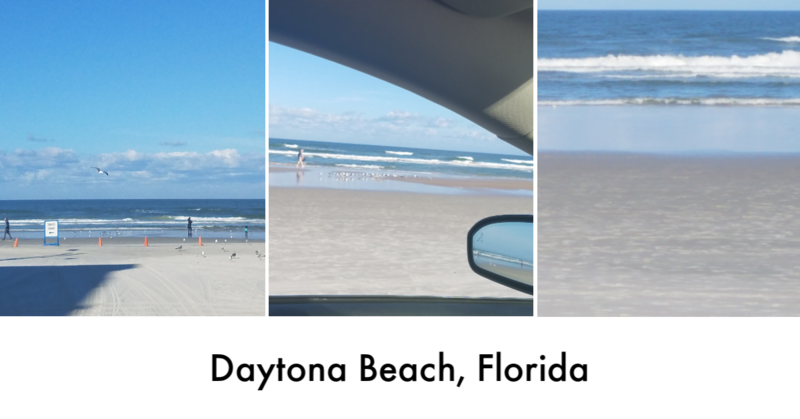 Home » Thoughts and Opinions » The Ultimate Scenic Drive: Driving on Daytona Beach! On our last trip to Florida, my husband and I got into the car and headed north on Highway 4. We left Orlando around 9:00 am not sure where we were going. Two and a half hours later we found ourselves in Daytona Beach. We both had never been there, so we thought we would check it out. Because it was around lunch time, we started looking for a place to get a bite. We wanted to eat on the beach and Landsharks fit the bill. Being we are BIG Jimmy Buffet fans, we knew this was the place for us. We sat at a table outside overlooking Daytona Beach. What was the first thing we saw on the beach? Cars! Yes, people were driving on the beach. I had heard about this but have never seen it. My husband and I looked at each other and new what we were going to do next. We asked our waitress and she directed us to the entrance for cars and indicated they could answer all my questions. So, after a great meal we did just that. When we pulled up to the booth to pay, I was fortunate there was no one behind us so I could ask a lot of questions. The beach is open to vehicles from 8:00 am to 7:00 pm (or sundown), tides permitting. The cost is $20 per car, per day with one re-entry per day. The price is the same all year round. The speed limit is 10 miles per hour, and it IS enforced. Under no circumstances are you allowed to pass another car, even if it appears to have stopped. There is two-way traffic. You can drive in either direction. Park perpendicular to the beach, and be careful not to go beyond the posts into soft sand. Parking near Ponce Inlet on the New Smyrna side is limited, and soft sand plays havoc as people try to double park. Park a little further south and avoid the congestion. Driving is permitted sunrise to sunset from November 1 to April 30, and from 8 a.m. to 7 p.m., May 1 through October 31, tides permitting. Unusually high tides can close down driving. 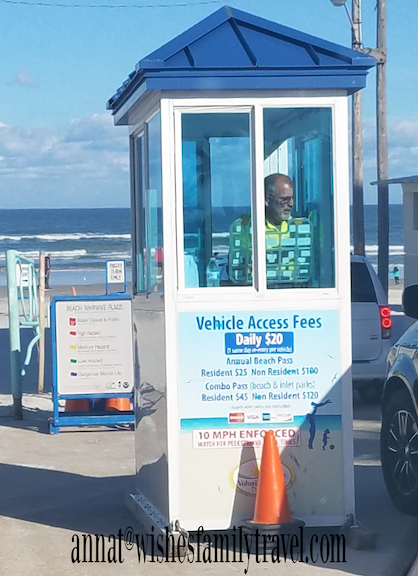 You can exit the beach and re-enter once without paying an additional fee. Watch out for kids playing on the beach. Must have your windows down in car at all times. After learning all the rules, we set off on our adventure. Windows down, off we went! The sand is very hard packed, not that soft sand you think about when you are at the beach. People are parked and out having a fun day on the the beach, so you must keep a good eye on the sandy road. The little ones out playing don’t look for the cars and we had two children run right out in front of us. Thank god for only doing 10 miles per hour. We drove for a while then pulled over and parked so we could walk to the water. We stopped on a stretch of beach where there was on no one around so we had the beach to ourselves. Walking on the hard-packed sand is a lot different and a lot easier than the soft sand I am used to. We hung out for a while then got back into the car and drove some more. This, I have to say, is one thing I can check off my bucket list. We will for sure be back and the next time will have beach chairs and spend the whole day. If you have never done this, I highly recommend it. It was surely an adventure we will never forget. If you have any questions, I would be happy to talk with you. You can email me at: annat@wishesfamilytravel.com or you can go to my Facebook page and message me. Now I am off to my next adventure!